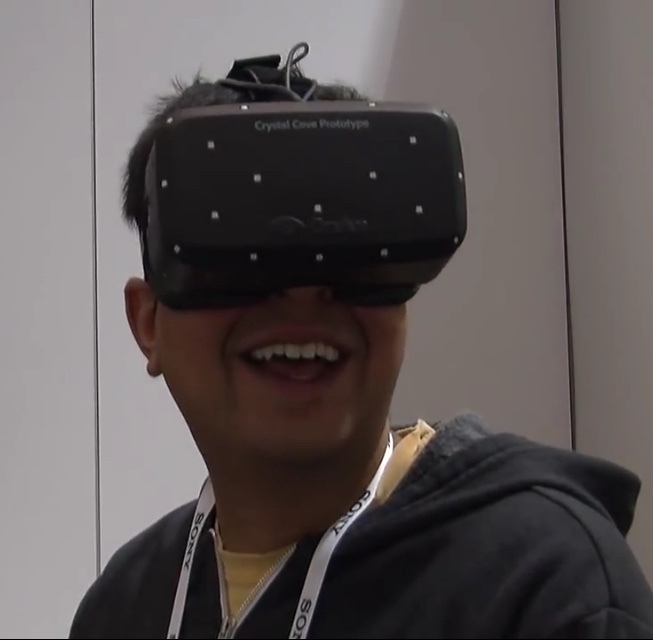 Check out our own chief VR enthusiast Asif Khan taking a closer look at HTC Vive straight from CES. As the battle for VR dominance heats up, Shacknews' Asif Khan takes a first-hand look at the HTC Vive with an interview JB McRee. We could use any kinda social media bump, so that is awesome! It looks like if you're going to move around much at all that the cord would be a tripping hazard. When you are in the chaperone feature, you can actually see where the cord is. Better than Norm's, even, mostly because the person he was interviewing was not answering anything but I liked your organic style much more! Wished I had known you were gonna check it out because I wanted to know how the new grip (side) buttons feel. Not sure you tried a demo where you could use them. Norm described them as "more rubbery", I want to know if they are more comfortable to use than the awkward grip they require on the VK1. Thanks! The side buttons do kinda feel more rubbery than button-like. They are definitely more comfortable than the past iterations. I didn't actually have to use them in any of the demos. Norm's questions about the second dev kit pushing back the availability of the final iteration were very important though. I was frustrated by the lack of transparency. You can't build 7k of units in January, wait for feedback, and then say you're going to hit an April release date with an updated product. Something has to give. Remember when they said they would be first to market, out for the holidays? Then that there would be limited availability in december? These 7000 units could be that, the first of the original consumer version production run until they decided to stop and work on it more. This would mean they are already aware of the issues with this version for a while now, no more developer feedback required. Assuming this the consumer version may be in production already. In the end htc knows what's up so if they say april, they must be ready for april. My brother says this is the best Vive interview he's seen yet, including Tested and Tom's Hardware one. Thanks for the kind words. Definitely a huge shoutout to our good buddy awkwardhamster for helping me out this week at CES. Yea, he is a good friend of mine. His YouTube channel is pretty awesome too! I like Tested but I miss Will. Especially Will driven Podcasts. Hopefully Norm can step up once he gets settled. Good news is that Will is going to be doing VR stuff with his own company. Maybe not reviews, but I'm excited to see what he can come up with. I ran into him at Oculus Connect and he said he is working on some Made for VR content. Should be cool. I hope he comes back here to post about it when he's ready. it helped he got an interviewee that could answer questions. Awesome video and info man, thanks for this I really enjoyed it. Cool you guys are getting these exclusive low downs, good stuff. Totally keep doing these, I dig them, it was really well done. I love HTC and valves no compromise approach I'm absolutely waiting for this I am not going to do the oculus pre-order. Sure, so, how tall are you? It's a requirement to own the site. Technically, it's the only requirement. It's a requirement of owning the site. Technically, it's the only requirement. Nice job with the interview! Cool interview! What they're working on definitely sounds interesting. They need to do something about those cords man. There is a comment on the video which makes sense, and that's to attach it to your hip or something so it isn't just dragging on the floor. Totally agree with you man ^^^^ that was my only beef as well, I hope they fix that. There isn't really an elegant solution to it that I can think of short of going full wireless or not standing up with it. Cables are not going away anytime soon. Agreed. It isn't that big of a deal, you just have to become mindful of the cord's presence. Yeah pretty much, all well its got to evolve slowly I guess, can't have the ultimate right away. I'm assuming latency is the real issue. Stuffing a full 8-channel, 7Gbps (8XXMByte/s) 802.11ac wifi transceiver into the headset is probably not reasonable. Maybe a backpack accessory would be reasonable, but still hiccups of wifi. I don't pull any punches. On that note did you see the 3rd party manufacturers pretty much confirming the headphone jack on apples new products going the way of the dodo? this is going to piss of a lot of people. 5: Hope it plays or is charged? Apple will make a Beats branded headphone that works with lighting port. They will create a dongle for the rest of us people that like quality headphones. They do, talk about a company on the ropes. I don't see how it will cost anywhere less than $1,000 though. HTC does not have "facebook money". And I don't see them selling it at cost/loss. The HMD is worth $600 on it's own (if Oculus really is selling at or around cost), so the controllers + lighthouse is at least a couple hundred bucks more. I hope i'm wrong, but I see $1k as the minimum for this thing. I see the Vive as being in the same ballpark as expensive home theater equipment. Wall mounted wireless hardware is more than just an accessory. It's going to be like a high end 7.1 audio setup. We did a Vive demo yesterday with HyperX's upcoming 7.1 headphones, it was pretty awesome. That's a pretty solid interview, actually watching you and the other staffers do stuff with it was really neat. I imagine there will be various third parties providing that. Very nice to meet you at BB8! Great stuff Asif. So I assume you're going to get both. If you had to bet on one today, who would it be? What are their chances of hitting their date and ramping up manufacturing to any acceptable degree? I mean their phone design cycles are much longer than what they've been with the Vive. That is a really interesting question. I should probably write an article about that. I thought you were being facetious so I checked the FP for an article. Yes please write it! Haha made you look! Nah, I will try to write something soon. This link just opens to a black page in Latest Chatty. :( there is no to open in safari either. Very nice interview! How were the visuals themselves? Very impressive. Clearly not real, but comparable to a high end PC game. Except you are in it! 1. 802.11ac wifi provides theoretical 7Gbps. While this would be difficult to fit into the headset, what issues have kept it from being considered as a backpack accessory that is wired into the headset? What is the latency of 802.11ac? I almost typed that into my post, but assumed it was negligible. I don't have numbers and my 30 second web search didn't produce a nice, pretty table so I just left it out of my post in hopes someone smarter than me knew and would lol at me with the stats. If I plug my PC to ethernet and the stream mini to 802.11AC I get 3 to 50ms of latency (with an average of 8ms). If both ends are on 802.11 AC It goes from 10ms to 150 (with an average of 20ms) What makes the experience of streaming so much better on powerline, however, is how the latency is steady and predictable. Would batteries packs be able to run a router long enough without being a terrible weight constraint? Latency needs to be ~1ms or less for it to be feasible. The entire pipeline has to be no more than 20ms. Awesome interview. I love you Asif. 40+ is the current count.